You'll be £10.00 closer to your next £10.00 credit when you purchase Regional Tramways - Wales, Isle of Man and Ireland, Post 1945. What's this? This is the fourth book in a series that covers the history of the tram systems of the British Isles post-war. It covers the networks in Wales, the Isle of Man and Ireland. Peter Waller examines the history of the tramways in Ireland, Wales and on the Isle of Man. With three different legislative frameworks, the history of the systems covered are very different – from the surviving horse tramway at Douglas on the Isle of Man through to the new Luas system operating in Dublin. With an overview that provides the background to all of the tramways that once operated – plus the only tramway in the Channel Islands – alongside a comprehensive account of those systems that survived after 1945, the book is a fascinating portrait of the changing streetscapes of cities like Belfast and Cardiff as well as the remarkable survivor post-war, such as the Bessbrook & Newry and the Llandudno & Colwyn Bay. Fully illustrated throughout with mono and colour illustrations – many of which have never been published before – as well as system maps, the book will be of interest to all with a history of trams – past and present – in the British Isles. this is an interesting and informative book and has all the expected qualities including a bibliography and index which make it a work of reference for extended research. our readers will enjoy it. The book is a feast of nostalgia recalling how important the tram was. The range of historic photographs is excellent as is the description of what little is preserved. This volume is well-researched, well-written and easy to read. The author definitely knows his subject. 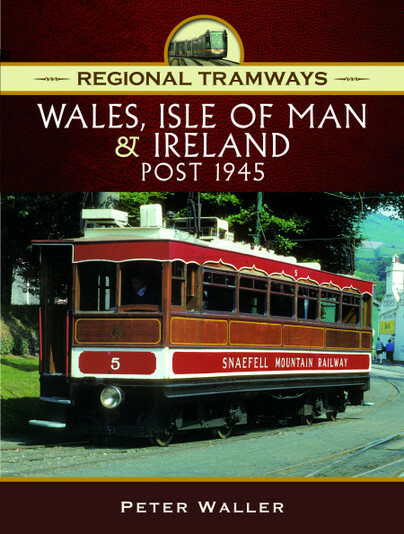 As a result, this book is likely to appeal to those railway enthusiasts with a particular interest in all forms of street tramways within Wales, the Isle of Man and Ireland since 1945. It may also be of interest to those with a more ‘generalist’ interest in public transport within the British Isles while Historians with an interest in British and Irish Social History may find the images and text informative and useful.